From a simple handrail to a full-on staircase renovation, we are dedicated, passionate and talented when it comes to transforming your staircase. 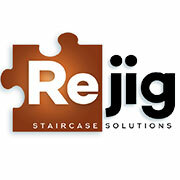 At Rejig we have the workforce and the skill in place not just to supply a new staircase, but renovate your existing one. A transformed, exciting, affordable bespoke staircase is only a few clicks away. Contact us today for a free survey – and expect convenient, hassle-free and spectacular results.